As you learn how to study the clouds and understand what these clouds mean is one of the key objectives of a determined enthusiastic sky watcher. If you are looking for altocumulus lenticularis clouds you need to know exactly where to go to find them. These clouds are mid level clouds and can be found at any altitude from 6,000 feet to 20,000 feet. What are altocumulus lenticularis clouds? These clouds form from a gradual up draft of warm moist air containing water particles that will form into clouds at any height over 6,000 feet. Altocumulus clouds can appear in various different forms and the most common forms are those clouds that look like cotton wool balls or a chain or band of small blobby clouds that move slowly across the sky. 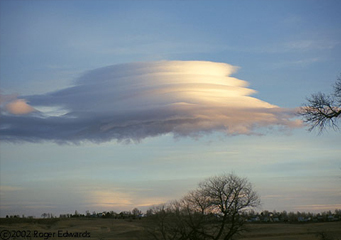 Altocumulus lenticularis form in a particular way and will be formed over high mountains in practically any area of the globe apart from the Antarctic. How are altocumulus lenticularis clouds formed? In order to form lenticular clouds it is necessary to have mountain peaks nearby, altocumulus lenticularis clouds form over mountains and they will not form over flat land or countryside. The reason that they can be found over mountains is that the mountains force warm humid air heavy in water particles up into the higher atmosphere. As these water particles rise, they cool and form a cloud formation that pass over the mountains, having passed over the initial mountain peaks they gradually dissolve. Then they will fall into the valleys and this will allow the temperature to rise and water vapor is formed again therefore causing the formation of new altocumulus lenticularis clouds. What height are altocumulus lenticularis clouds found? Altocumulus lenticularis clouds are a classically mid-altitude cloud formation that can be found at heights of between 6,000 and 20,000 feet. Given that altocumulus clouds form over mountains their normal formation is going to be in the higher altitudes of this range. So typically altocumulus form at about 10,000 feet or more up to 20,000 feet, this sets them aside from other altocumulus clouds. How common are altocumulus lenticularis clouds? Altocumulus clouds are formed given particular geographic conditions and the result is a most particular form of cloud. When seen they look like anything from a pile of plates arranged in rather haphazard pile to a shape that makes many observers think that they are looking at a flying saucer. These clouds are generally rounded and do not appear in the lumpy form of other types of altocumulus clouds. Given that their formation relies upon mountains and valleys the places that you can see them at their best are very limited. If you decide to go to observe these clouds, it is a good idea to take your camera to get some spectacular results. A well formed altocumulus lenticularis cloud is remarkable and well worth following to be seen in all of its strange majesty.